Since I’m a software engineer and technologist, most people aren’t surprised that I’m strongly in favor of net neutrality. In the past few years, it’s attracted increasing media attention, and recently net neutrality has been addressed by various presidential candidates. John Oliver devoted an episode of his show Last Week Tonight to the topic, which received a lot of attention alongside numerous other advocacy efforts in favor of net neutrality. Comments from concerned Americans actually crashed the FCC’s request for comment website. All in all, the FCC ended up with 3.7 million comments, setting a record as the most-commented issue in the agency’s history. In early 2015, as a result of this campaign, the FCC passed a reclassification of broadband services to become ‘common carriers’, which is effectively a curse word among dissenting ISPs. Common carrier classification, at its most basic, prevents ISPs from charging some content providers for improved service over other content providers. 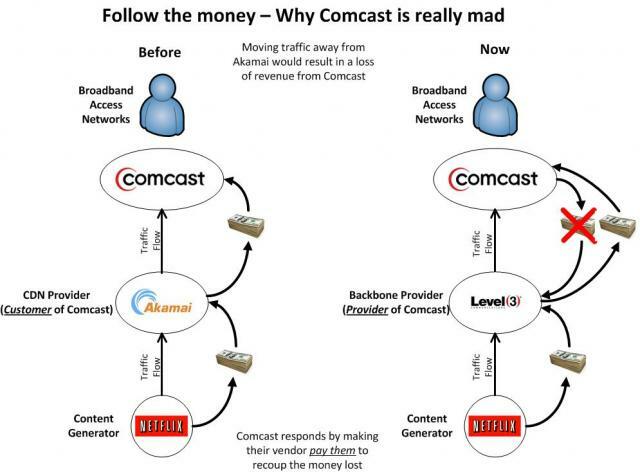 For example, if Comcast wanted to provide a digital streaming service via the Internet (as they are both a television and broadband provider), it could not intentionally throttle internet traffic to a competitor such as Netflix, in order to drive consumers to use Comcast’s service. In exchange, common carrier status gives the ISP immunity when it comes to what traffic goes across their networks; Comcast, for example, wouldn’t be responsible for illegal content that its users access over its service. However, after a few examples of this sort of sabotaging behavior by ISPs in recent years, the FCC was obligated to step in and make a judgment call. Since then, politicians and ISPs have been grousing about the economic results of such a choice, and some have been actively attempting to overturn the classification. Jeb Bush announced recently that, if elected, he would eliminate the net neutrality ruling. Earlier this year, Hillary Clinton voiced her support for President Obama’s call to safeguard net neutrality. Chances are, net neutrality will remain a hot-button issue in upcoming elections. As a technologist, I want to take a comprehensive look at a real-life example of why I believe that we continue to need a net neutrality strategy. This article will be the first in a three-part series that discusses some of the core concepts involved in net neutrality, as well as directly addressing a few concerns people have about net neutrality. You type the name of my website, http://www.anthturner.com, into your web browser. Your computer talks to your ISP (Comcast, Time Warner, Verizon, whoever) and asks it for my website. Your ISP has two options for how to treat this request. 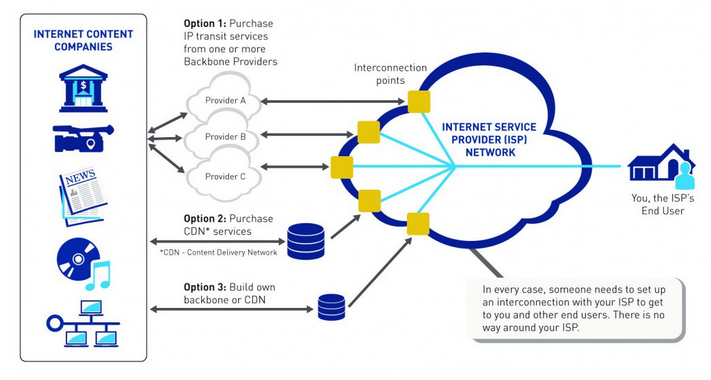 It can either ask for the website from the website’s own network, assuming the ISP already has a “peering connection” (a usually-free agreement between multiple high-traffic providers to facilitate exchange of traffic across the larger Internet) with that network, or it makes the request to the ISP’s own Tier 1 provider, via a transit connection, a purchased agreement to route traffic from the ISP to a Tier 1 provider and whatever is on the other side (usually through one or more intermediaries). Think of this Tier 1 concept as your ISP’s ISP, and the ISP Peering as if you put down a really long cable directly between your ISP and Google. If needed, the Tier 1 provider uses an existing peering connection with one of the other Tier 1 providers, to get to my website’s nearest Tier 1 provider. Tier 1 providers, as a side note, are all interconnected to provide redundancy and capacity management in the event of an outage. These connections are free between Tier 1s, because they benefit both Tier 1 providers, as they can expect similar costs to send and receive data to each other. That Tier 1 provider talks to my web host via another transit connection (again, usually through one or more intermediaries), which delivers my website back across that connection. What does all this mean? Well, it boils down to two core points: Tier 1 providers can talk to each other free of charge, ISPs can talk to each other (usually) free of charge, and ISPs pay Tier 1 providers for service to networks they are not already peered with, similarly to how consumers pay their ISPs for service. As a note of interest, in 2010 it was said by Internap that every single major cable operator in the US, except Comcast, had settlement-free peering relations with large websites, content distribution networks– anything that would create large amounts of traffic. These relationships were formalized among only large entities to ensure that both parties were sufficiently professional such as to conduct a resource-intensive business relationship. Right now, there are (depending on whose list you’re looking at) around 16 Tier 1 providers in the world, including names you might recognize like AT&T, Verizon, CenturyLink, Level 3, and Cogent. In 2010, Level 3 Communications, a Tier 1 provider, was having some serious financial trouble, and was pivoting its role in the network market to become not only an upstream provider (“ISP”) for companies like Comcast, but a content distribution network (CDN) for companies like Netflix. As Netflix increased in popularity, Level 3 began sending more traffic into Comcast’s network over their peering connection than they were routing out of Comcast’s network. (Remember, Comcast is paying Level 3 for their Tier 1 service.) In Comcast’s mind, then, they began to ask why they were paying Level 3 for transit when Level 3 was leveraging their business agreement in a favorable way for themselves. They argued Level 3 was taking advantage of their peering agreement, as Netflix also paid Level 3 for its CDN services; Level 3 was getting paid both by its delivery target and its content provider. Comcast’s arguments were chiefly around operating expense; it argued it shouldn’t be responsible for handling a large increase in traffic over its own network without collecting money from Level 3 to cover expenses for new hardware and upkeep. Level 3 offered to financially help Comcast handle the load with certain routing ‘tricks’ to get traffic off of their main network and “dropped off” closer to the user requesting it, significantly easing the burden on Comcast. They also offered to purchase all the required equipment for Comcast (at approximately $50,000 per port). Level 3 ultimately ended up acquiescing to Comcast’s demands and paying for the traffic across Comcast’s network instead of buying the required capacity upgrades on Comcast’s behalf, likely in order to keep its contract with Netflix in good standing. Ultimately, while it was seen at the time as just another peering dispute, this argument cracked open a larger concern over the roles of upstream providers and CDNs in an era where high-bandwidth applications were becoming increasingly common. Please check back tomorrow for the link to the next part of my series on net neutrality — or click the button at the bottom of the page to follow my blog, and receive new articles instantly via email! Tomorrow’s post will discuss how Netflix evolved their business model from a technical standpoint to overcome ISP throttling issues, and how ISPs maintain such a good negotiating position. Just as a reminder, all views expressed in this blog are mine only, and do not necessarily reflect the views of Microsoft or its vendors or customers. Posted in Opinions.Tagged computing, fcc, net neutrality, networking.